In a nice follow up to my last post, the City of London have released their report on the cheque cashing situation. This was a follow-up to a letter that the London Homeless Coalition had sent to the City, triggering a follow-up from their research division. I had the privilege of participating in the consultations. Streamlining access to government ID. In particular, if individuals are already going through an identification process with Ontario Works, it doesn’t make much sense that they have to then do the same for a health card. Indemnity agreements. What does this mean? Well, for example, the federal government has indemnity agreements with all banks for income tax and GST cheques. This means that the feds take the risk of any fraudulent actions. In Manitoba, the province has done the same thing with social assistance cheques. This means that anyone could cash an OW or ODSP cheque at any bank, the province assumes the risk. The current social assistance rates provide an income at less than half the Low Income Cut-Offs (LICOs). A dignified social assistance rate would require an immediate increase of 43% to bring us back on track with rates prior to 1995 cuts. Nutrition support for people experiencing homelessness is greatly dependent on the charities and faith communities in our city. Food banks require provincial support at a minimum of funds matched to those provided by private donors. When a person is living homeless, they lack private spaces in which they can live, love, and be. Drop-in centres must be considered an integral component of supporting people through difficult times, particularly in our harsh climate. Provincial support of drop-in centres could be accomplished by matching existing federal HPS funding. More and more, we are finding people who are homeless who are also employed. Increases of the minimum wage are key to addressing this issue, and need to be continued, annually, indefinitely. 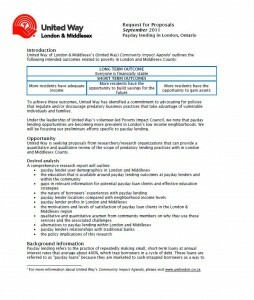 The London homelessness Outreach Network has drafted recommendations for provincial MPP candidates in regards to poverty, health, housing, and homelessness. 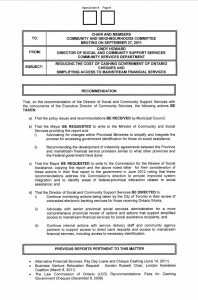 To view the document, please click HERE. Identification is one of the primary barriers to accessing healthcare for a person experiencing homelessness. Those in this situation should have access to one free issuing of the new Ontario Photo Card. Additionally, walk-in clinics should provide the same scope of services without a Health Card as are available in emergency rooms. The majority of people experiencing homelessness have a lifetime diagnosis of mental illness. Tier 3 of mental health integration in the Southwest LHIN needs to include mental health care provided where people in poverty live, eat, and find shelter. ACT teams have been insufficient to prevent those receiving community based care from ending up homeless. Community Health Centres and Family Health Teams have improved access for a large number of people experiencing homelessness in our community. However, those who face the most barriers to care are not served by static agencies. We need provincially supported, locally delivered programs that provide street-level, outreach services for healthcare. Addictions are a large part of the picture of chronic homelessness. London needs to greatly increase the number of addiction supportive housing beds, to institute a wet shelter, and to have our own residential treatment facility of sufficient size for our population. London’s Community Housing Strategy calls for the building of 1000 new units of affordable housing over the next 5 years. With 4500 families on the housing wait list, we recommend that provincial funding would be provided allowing for this target to be doubled to 2000. Housing alone is not enough, and many living in poverty require support or find themselves evicted into homelessness. A provincial program is needed that ensures community support workers are in all affordable housing developments. Although the Hostels to Homes program has had limited outcomes provincially, the outcomes in London were very successful. A similar preventative/rapid re-housing program is required, and makes good fiscal sense. Smart housing at a community level involves housing of mixed incomes. Therefore, in addition to current grant incentives that have seen new developments of affordable housing, incentives need to be provided for developers to convert existing units to rent geared-to income (RGI). The agenda for our September meeting is now posted at http://www.londonhon.ca/?page_id=4. As mentioned below, we are taking the lead on this year’s event in London, Ontario. If you would like more information, the planning document is available HERE.